I’ve spent every spare moment lately getting ready for the workshop I’m presenting at the HSC homeschool conference this Friday. 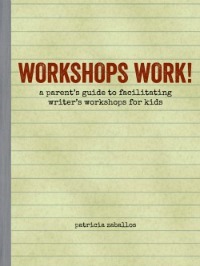 The workshop is called Nurturing Young Writers. I’ll be speaking for an hour-and-a half. Yikes. I’m sure my family can sympathize with anyone who has to listen to me ramble on for an hour-and-a-half. Well. I do plan to open up the workshop in the last part, and have the group brainstorm writing ideas and audiences for their kids. Anyway, getting ready for this workshop has been good for me. It’s forced me to look at my thoughts on how kids learn to write, to organize and outline them. And the exciting part? There are some ideas here that I haven’t seen elsewhere. That might even be original. Transcribing kids’ writing–how it can be a powerful tool for helping kids develop their voices as writers, and how we can use it for years, until kids develop fluency at writing. How the main goals of a writing education should be helping our kids develop their writing voices, and helping them enjoy writing. 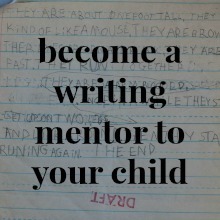 And how to let kids lead their educations as writers. How the mechanics of writing–spelling, grammar, penmanship–should be of far less importance than developing a young writer’s voice. And how those mechanics can fall into place naturally through transcribing kids’ writing, and helping them enjoy writing. 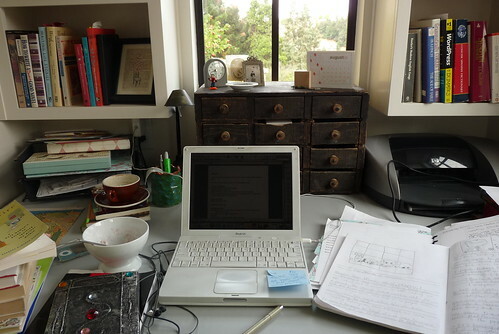 How creating a literate environment in your home can have a major impact on kids as writers. How kids can explore the craft of writing through casual, spontaneous conversations about the books you read together, and the films you watch. How to help kids find genres and styles of writing that interest them. How to make writing topics of any personal interest. How allowing kids to select their topics is much more powerful than assigning them. The importance of audience in motivating kids to write. And how to find audiences for homeschooled writers. So, what do you think? Are there any topics here that hold some interest for you? I’d love your feedback. Honestly they all sound interesting. Fire away! I am the choir on many of these subjects, so I’ll enjoy whatever you preach to me. 🙂 But transcribing kids writing is something I don’;t do a whole lot of. So I’d like to hear about that. But I’m really interested in styles and genres. Do you have the fantastic book “If You’re Trying to Teach Kids How to Write …You’ve Gotta Have This Book”? It has a double page spread of “alternatives to `Write a Story'” advertisements, advice columns, anecdotes, announcements, apologies, arguments, autobiographies, awards, ballads, bedtime stories, billboards, book jackets, bumper stickers, campaign speeches, cartoons, cereal boxes (this is a favorite at my house–a box of Sentient Being Cereal sits on Evelyn’s shelf), diaries, epitaphs, fables, grocery lists, invitations, jingles and so on. But it doesn’t have more complex genres, like the hermit crab essay you told me about, or talk about getting from the idea to words on paper. I do have that book, but I’d forgotten about those pages. I’ll bring it to the workshop! For a long time we had a box of Greek god cereal around here. What was it, Hermes’ Charms, something like that? With styles and genres, I think it’s really helpful to look at the types of books the kids like to read, or have read to them. You can take a topic like Roman times and find so many styles of books: DK types with lots of photos; silly Time Warp Trio adventures; Magic Schoolbus books; Horrible Histories; fictional journals with drawings like the Amelia’s Notebooks (Galen’s notebook); mock Roman Times newspapers; books on specific topics like architecture, science of the time, etc. All of those books have very different styles and voices, and kids usually have definite preferences for them. The types they prefer would be great types for them to try out on their own; they probably *get* that type of writing and would be able to do it well. It’s better than straightforward report-writing because not only do they get to show their content knowledge, they get to play with style and voice! If I have time during the workshop, I’ll be talking about wordplay. And I’ll be sharing the Restaurant of Resourcefulness! It’s such a fun example. I also found some really neat books on wordplay that I’ll have to share with you, Susan, I know you’d appreciate them. Here’s a link to the Restaurant of Resourcefulness, for those of you who are curious. And you should be! Oh, I am so running downstairs right now to turn our cereal boxes inside-out! What a brilliant idea! I have to come back later and read these comments, but really, must go now!!! This sounds like a fantastic book in the making. Let me begin by saying that I am a teacher (woefully in the public school system) but enthusiastically give three cheers to parents who make that serious commitment in teaching their children at home. May I add to your writing ideas: poetry is a love of mine to teach and sometimes gets forgotten or put on the back shelf because of the fear of rhyming. Rhyming should be the last thing to learn in poetry. There are oodles of books out there to help. Laurie, thanks so much for stopping by, and taking the time to leave a comment! I will definitely cover poetry. My middle child has taught me the importance of poetry–it’s invariably her writing style of choice! When we were studying the Renaissance before a trip to Italy, she wrote a long list of haikus about Florence. Definitely an alternative approach to learning about the Renaissance! If you have any other perspectives on what writing looks like in classrooms these days, please share. I’ve lost touch. I love being your shiny friend. And I love your project. I predict big things and lots of validation. And oh, maybe a tangential career? Why not!? Let’s do more planning. My kid will always eat ice cream. A lot can be brainstormed in the time it takes to get to the bottom of a small gelato. Well, you know where I got the word shiny, don’t you? Yes, I think farmer’s market meetings should be a regular happening, don’t you? Finally, a way to make sure we see each other! 🙂 I knew. Or, at least, I knew the word was current in my world. I love when things close circle. Thank you for the great ideas. I wanted to say about If You’re Trying… that I don’t like its emphasis on editing. I think beginning writers should get a lot of words on paper without editing. On the topic of audiences do you know about ZigZagZine? A 12 year old homeschooled girl publishes it and welcomes submissions. Oh, and I am thrilled that you’ll be sharing our game! Since then we have played it with a space theme and food theme from Asteroid of Anguish to Zigzagging Zucchini. I’m totally with you on the notion that beginning writers should get a lot of words on paper without editing. Heck, all writers should get a lot of words on paper without editing! It’s taken me years to learn to write cruddy drafts without revising them as I go. I didn’t know about ZigZagZine! I went and visited–what a great site! I’m so glad to have publication possibilities for kids to recommend. I went up and added a link to your blog post about your game–hope some folks see the link and check it out. I was hoping to write a post on wordplay so I could link it, but haven’t gotten to it. Maybe soon…I have got to try out the space version with Mr. T.
I have been enjoying a really wonderful transcribing experience with my kids, inspired by an idea in Family Fun magazine. The kids decorated shoeboxes to make “magic mailboxes,” and they dictate letters to imaginary people of their choosing–for my son, that’s Lego Power Miners characters, and for my daughter, it’s various storybook fairies and princesses. A few days later (when I get a chance to write a response, that is), a new letter appears in the mailbox. It has inspired lots of excitement around here and gives me a lovely little window into the kids’ hopes and dreams, too. I also think they’re getting a little taste of the give and take of letter-writing, question and response. I think I’ve been inspired to transcribe more and worry less about getting my son to write things down himself in part by you, Patricia. Thanks for that! Thanks so much for taking the time to share this, Carrie. What a fun idea! Kids love getting letters, and how especially fun to get them from their own imaginary characters! Mr. T would love that. I would love to read about it all. I am going to pass your blog onto my neighbor too.. looking forward to the good reads. Thanks Sarah! And nothing pleases me more than being passed along! Good luck with your presentation at the conference. I’m sure it will go well. Any topics about writing interest me. 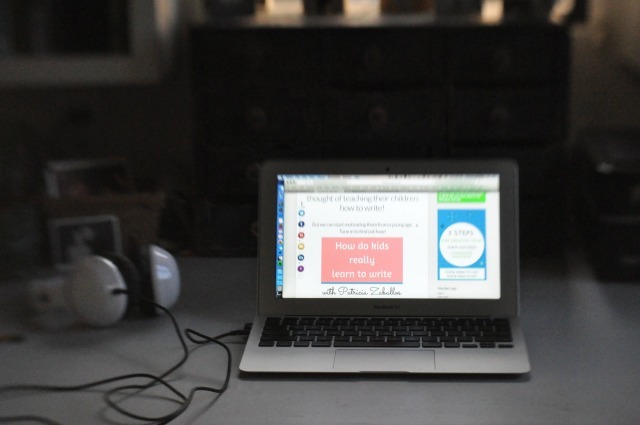 I will read those posts and incorporate them into our at-home learning. And please feel welcome to address me here as Tricia–you know that most people do! I use Patricia on the blog, since that’s the name attached to my meager list of publications. Just don’t call me Trish, or Pat, or you might get some wrath! I’d love to learn more about creating a literate environment at home. We read (constantly), we transcribe stories, but I always feel like I’m leading the show and trying to get everyone *excited* about writing. I’d love to hear ideas on how to get kids to become as passionate about writing as they are about listening to stories…or maybe that comes later? Oh goody, that’s a topic I’m excited about. I think transcribing their stories–or whatever they like to talk about–is a great start. But also just appreciating the craft of writers: talking about what they do well, and what we like about their writing. My kids and I are huge fans of listening to audiobooks in the car. It always prompts a lot of natural discussion: which character is your favorite; why did that character say that? It’s what teachers might call literary analysis, but to us it’s just having fun, enjoying a story together. I guess ideally, rather than trying to get our kids excited about writing, we parents can try to pay attention to what excites them. And then help them find ways to get that on paper. But your kids are young–it’s no hurry!